Beautiful villa with fenced private pool and a sleek, stylish design. The villa is nestled amongst the pine trees on a quiet place. 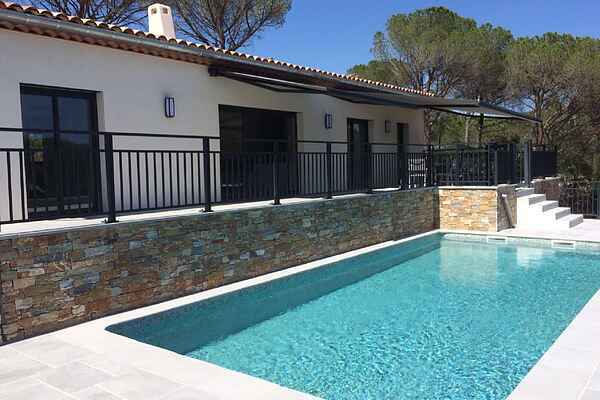 From the large semi-covered terrace you have a beautiful view over the nature Massif des Maures. The nature reserve Massif des Maurus is beautiful and ideal for cycling and hiking tours. Pause is done in one of the picturesque mountain villages such as Garde Freinet and Collobrières. Visit the impressive monastery Chartreuse de la Verne.De villa is only 3 km from the village of Vidauban. Here you get the groceries, lunch in one of the cozy restaurants (eg Restaurant La Bastide de Magnan just before the village of Vidauban) and remove regional delicacies at the marketplace. The holiday location is a good starting point for excursions to the many attractions such as the abbay Thoronet and the Gorges du Verdon and the lovely seaside resorts of Saint-Tropez, Sainte-Maxime and Frejus. Tip: If you drive towards Sainte-Maxime and are then take the ferry to the legendary Saint-Tropez. From the water you take the best pictures of this colorful fishing village!